September call-ups in baseball often signal hope and excitement for the fan base, as they get to take a look at the future talents of the organization. Lost amidst the chaos of the 1957 baseball season in New York were the debuts of two rookies, Rod Miller of the Brooklyn Dodgers, and John "Zeke" Bella of the New York Yankees. One team was on the verge of moving 3,000 miles to the West, the other convincingly won the American League pennant. Both of these youngsters shared not only their major league debuts within a few days of each other, but also sadly, their deaths. Miller passed away November 8, 2013 in Cascade, Idaho, and Bella passed away November 17, 2013 in Greenwich, Ct.
Miller was a 17-year-old outfielder from Lynwood High School in California. He was signed by scout Lefty Phillips for a $4,000 bonus, which meant he had to be kept on the MLB roster for the year and couldn't be sent below Class B. He played with Cedar Rapids after signing, batting .183, an unlikely total for someone who would receive a call to the major leagues at the end of the season. Despite his paltry batting average, the Dodgers brought him up in September, biding his time on the bench while in the presence of the legendary figures on the club. "The biggest thrill of my career," Miller said to Richard Tellis in Once Around the Bases, "was going into the Dodger clubhouse the next day, seeing all these legends, and putting the major-league uniform on." On September 28, 1957, the Dodgers were playing the Philadelphia Phillies at Connie Mack Stadium in front of barely 5,800 people. It was an otherwise unforgettable game, except for the young Miller. In the top of the 9th inning, manager Walter Alston summoned the 17-year-old from the bench to pinch hit for Randy Jackson. "I didn't believe him at first. I thought he was kidding," he said. Standing in the on-deck circle, Miller thought about the generosity of his manager, who also had only a singular at-bat in the major leagues. "I thought about the compassion Walter Alston had for me, letting me get to bat. He was the classiest human being I've ever known," he said. Miller faced Phillies right-hander Jack Meyer, and after working the count to 2-2, he struck out swinging. Alston replaced Miller with Pee Wee Reese to play third base in the bottom of the 9th; it would be the last time Miller's feet touched major league soil. "You can't imagine the residual benefits I've had in my life from that one time at-bat. It's opened more doors than I ever have imagined," he said. On the other side of town, Bella was a 26-year-old Korean War veteran, hitting his stride after serving three years in the United States Army. He batted .317 with the Denver Bears of the American Association in Triple-A, his third consecutive .300 season in the Yankees farm system. During that September, with the Yankees having a comfortable lead over the Chicago White Sox in the American League standings, they recalled Bella for a look in the outfield alongside Elston Howard, Mickey Mantle, and Hank Bauer. Speaking with the New York Daily News in October, 2013 after being inducted into the Greenwich High School Hall of Fame, Bella said one of his clearest memories of Mantle was the on the first day he reported to the team. "I walked into the clubhouse," remembered Bella, "and Mickey yells across the room, 'Hey Yogi, Zeke’s here. You’re not the ugliest one here now!'" Bella went 1-10 in his rookie campaign, earning his first major league hit off of Rudy Minarcin of the Boston Red Sox on September, 27, 1957. 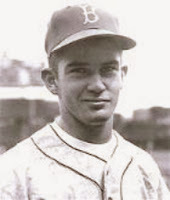 Despite another season of hitting over .300 at the Triple-A level, there was no room on the roster for him on their World Series Championship team in 1958. With the Yankees looking to bolster their pitching staff for the stretch run of the 1958 season, Bella was part of a late-season trade to the Kansas City Athletics for pitcher Murray Dickson. His trade to Kansas City provided the opportunity for greater playing time, as he appeared in 47 games, batting .207 with one home run. His time in Kansas City was highlighted by a race with a teammate to the dugout from the outfield that had gone awry, resulting with Bella knocking himself unconscious on the dugout roof. 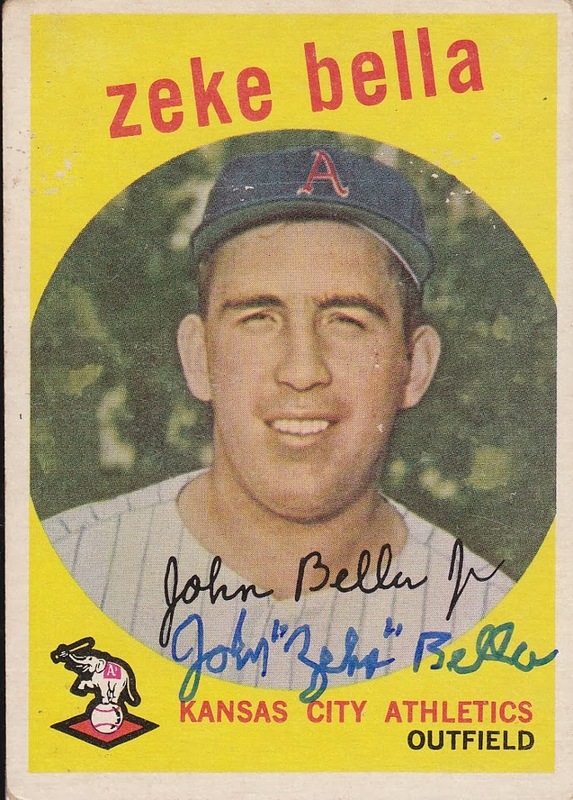 Bella played one more season in the minor leagues in 1960, before returning to Connecticut where he embarked on a long career with the United States Postal Service. He continued to stay involved in youth sports, serving as an umpire and referee at many levels. One of the local youths he inspired was future Hall of Fame quarterback, Steve Young. "I remember Zeke Bella and how he umpired," Young said to the Greenwich Time in October, 2013. "He's a tough guy, and I learned about fairness from him."